Welcome to the latest installment of the Wednesday Wake-Up Call, a weekly roundup of the most pressing conservation issues important to anglers. Working with our friends at Trout Unlimited, Backcountry Hunters & Anglers, the Theodore Roosevelt Conservation Partnership, The Everglades Foundation, Captains for Clean Water, Bullsugar.org, and Conservation Hawks (among others), we’ll make sure you’ve got the information you need to understand the issues and form solid opinions. If you know of an important issue–whether it’s national or local–that anglers should be paying attention to, comment below, and we’ll check it out! The 90-day public comment period on the Pebble Mine Draft Environmental Statement is almost half over, which means that you should make your voice heard via email or attending a public meeting. The two hearings expected to draw the biggest crowds are in Homer, Alaska, tomorrow night (4/11) and in Anchorage on Tuesday night (4/16). Save Bristol Bay will be holding rallies before both meetings. Click the links for more details. Today, at 2 p.m. Anchorage time (6 p.m. EDT), Trout Unlimited Alaska is hosting a Facebook Live discussion to hear Program Director Nelli Williams discuss TU’s DEIS findings, the potential impacts to the recreational fishing industry, and what you can do to help us stop Pebble now. Click here for details. Two blog posts on the Save Bristol Bay site discuss environmental dangers of the proposed mining operation that you might not have considered: Toxic Selenium in discharge water and the effects of mining dust on nearby and downwind ecosystems. The financing for the proposed mining project seems to be in some jeopardy, as well, according to a post on the NRDC website. Text WATER to 52886 to make a difference today! 3. What’s Going on with Striped-Bass Populations? 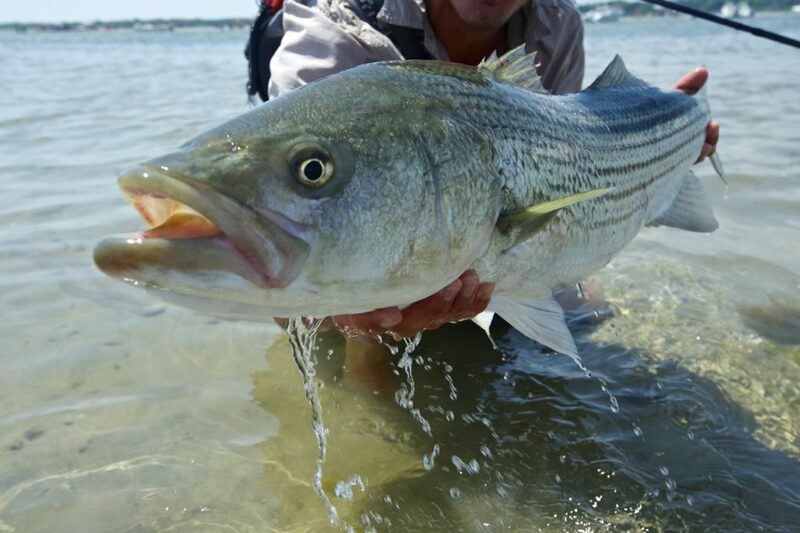 If you want to get up to speed on the issues facing striped-bass stocks along the Atlantic coast, then you’ll want to read “Striped Bass 101,” a three-part series of posts on the American Saltwater Guides Association website. This first post is entitled “What went wrong and how we ended up here,” and it does a great job explaining striped-bass biology and recent management history. 2004 seems to have been the turning point for striped bass. In retrospect, it was the first year of a long decline that has not yet abated. A benchmark stock assessment released in 2008 indicated that biomass was decreasing but didn’t generate any concern among the Board as biomass remained above target and fishing mortality was at thetarget level. Catch and release, single barbless hook, artificial lures or flies only. I agree with Bob Triggs, but I also feel certain waters should be closed to protect endangered areas and fisheries.